We all know that glorious smell… walking into a local mom & pop chocolate shop, where the rich, fresh, scent of handmade chocolate fills the air, and fills our tummies with a voracious hunger. Truffles, candies, bars, tumbled nuts, we want it all. Chocolate makes us happy. It’s the perfect gift, the perfect snack, the perfect partner for a cup of coffee, and the perfect period to a delicious dinner. But those decadent, decorated truffles don’t look anything like the delicate cacao bean… the original birthplace of what we call chocolate. We certainly weren’t the first people to figure out how wonderful chocolate is, and we certainly won’t be the last. But, let’s hop back a few years, and see how chocolate poured its way into our hearts. What we have come to love as the sugary sweet chocolate we eat today, is entirely different than the original. Traveling all the way back to the ancient Mayans and Aztecs, a chocolate drink was derived from the cacao bean. Used in ceremonies, rituals, and for health benefits, this bitter beverage was poured repeatedly between vessels to create a frothy, rich drinking chocolate. Cacao beans were often used as currency, and traded for other foods and items. As chocolate made its way through time and over oceans to the Americas, and Europe, the bitter taste didn’t jive with its new demographic. Sugars and honeys were added, keeping chocolate in its decadent liquid form. Chocolate became the new “it” product. Used as a status symbol, and for medicinal purposes, poured chocolate soon found its solid form. Barred, and boxed, chocolate kept its value and was often used as wages for soldiers. Today, chocolate has found its place in the art world. Food isn’t just for eating anymore, it’s for creating and expressing, and finding new ways to wow the world. 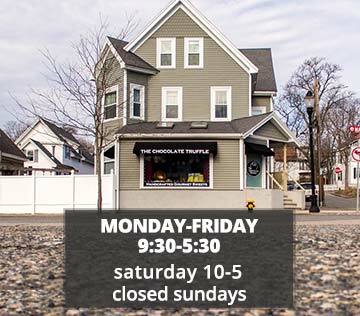 Here, at The Chocolate Truffle, we strike a perfect balance of classic and innovative. Whatever form you like your chocolate in, we guarantee it will always make your mouth water and wanting more! Fall is setting in, and nothing warms the heart and makes the tastebuds jump like a sweet bite of homemade chocolate! Bring in the season with us! Stop by the shop and breathe it in… the crisp fall air, and the rich smell of history, family, and happiness!